USPA NEWS - 200,000 people, according to the conveners, or 45,000 according to the Government, demonstrated this Sunday in the central Plaza de Colon in Madrid, called by the conservative Popular Party, the centrist Citizens and the extreme right Vox, in defense of the unity of Spain and against the socialist Government of Prime Minister Pedro Sanchez, to whom they demand the convocation of early elections. 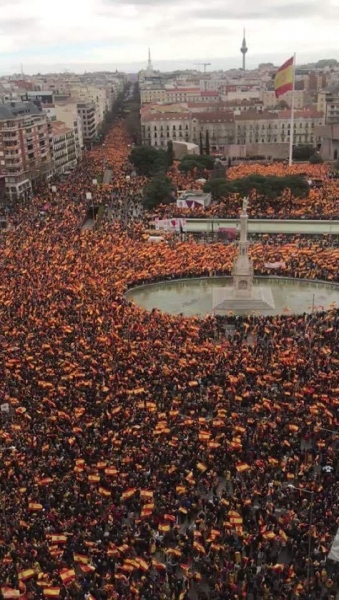 The negotiations of the Government with the Catalan separatists are the trigger of the great concentration that this Sunday filled the streets of Madrid in defense of the unity of Spain. During the previous days, the Government and the Catalan separatists had announced their agreement so that an intermediary -relator, the Government calls it- directs negotiations between both parties, which, according to the opposition, amounts to granting Catalonia the status of a country sovereign and that, in his opinion, is a betrayal of Spain. The pro-independence demand that the right to self-determination of Catalonia unequivocally be included in the negotiations led the Government to declare the negotiations broken on Friday. As a result, the Catalan separatist parties presented in the Parliament amendments to the entire bill of the General State Budgets Law for 2019. For the convenors of the demonstration on Sunday, "the events of recent days are a humiliation of the State unprecedented in our democratic life." 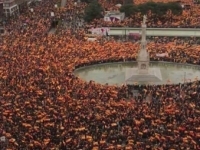 The great demonstration this Sunday in Madrid also demanded the convening of early legislative elections. The organizers accuse the Prime Minister Pedro Sanchez of not fulfilling his own promises, since when in June 2018 he presented the motion of censure against the conservative Mariano Rajoy, he assured that he would call elections as soon as possible. He has not done so and has even announced his intention to exhaust the legislature. A sea of Spanish flags reminded him this Sunday in Madrid. The concentration was uneventful. Hundreds of buses from all corners of Spain came to the capital loaded with people willing to express their rejection of the Government and defend the unity of Spain. The leader of the right-wing Vox, Santiago Abascal, said that "the unity of Spain is not negotiated" and demanded a prison sentence for the Prime Minister. Pedro Sanchez will undergo his most difficult exam on Wednesday. Parliament will vote on the amendments to the entire draft General State Budgets Law. If the amendments succeed and the draft law is returned to the Government, the Prime Minister could be forced to call elections. It was announced recently by the Vice President of the Government, Carmen Calvo: "If the budgets are not approved, the legislature will be shorter," she said.